Hoylake,situated on the estuary of the Dee, derived its name from a deep-water channel which in the latter part of the seventeenth century ran through a vast sand-bank known as Hoyle Bank. This channel has silted up, and practically no traces of the original one now remain. 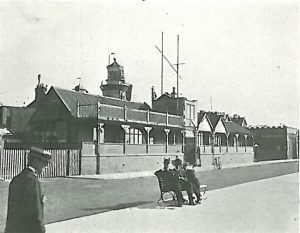 At the time of the formation of the Hoylake Sailing Club, however, the Hoyle Lake afforded anchorage for large fishing boats, and the village was a fishing centre at which some 500 men and boys were employed. The club was formed in September, 1887, when some twenty resident boat-owners deemed it necessary to safeguard their interests against the importuning of longshoremen by forming a club.